California and the Sierra Nevada are well know for the Gold Rush years of the mid 1800s, but for weather weenies like myself (and you likely fall into this classification if you are reading this blog) there is a wealth of beautiful long term climate records for the region just waiting to mined. As a weather and climate researcher data mining is a regular part of my job, and the long term observations really fascinate me. 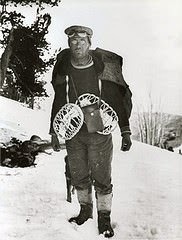 Dr. James E. Church, who originally came to Reno in the late 1800s to teach foreign languages at UNR, developed the Mount Rose snow sampler in 1906, and the Mount Rose site now has one of the longest snow water equivalent records in the country. Donner Summit and Mount Rose both have snow course records archived back to 1910, and can be found at the same pages as the Natural Resources Conservation Service SNOTEL data (http://www.wcc.nrcs.usda.gov/snow/). Below I have plotted up both sites showing the measured snow water equivalent on April 1st, which is considered about the time of maximum snow pack in the Sierra. Some interesting things stand out when comparing the two sites. First, when considering the current drought 2014 and 2015 are the two lowest values in the Donner record, but at Mount Rose 2015 is tied for third lowest rank with 1948. The lowest value at Mount Rose was in 1924 followed by 1931. There are likely two main factors contributing to these difference: (1) orographic effect (Donner situated just west of the Crest, and Mount Rose in the Carson Range) and (2) elevation. From a skiers perspective, we know that during many storms, Donner and Rose can get similar snowfall or often times Rose is shadowed and Donner gets more, and rarely (during upslope events) Rose can be the big winner. The high freezing levels (ridiculously warm temperatures) during the past two winters is likely the main reason for Donner snow water equivalent being so much lower than Rose (~2000 feet elevation difference), and has played big role in the "snow drought" (here and in the Pacific Northwest). Streamflow records can tell you quite a bit about drought conditions as well, particularly when you accumulate the streamflow throughout the course of the water year. 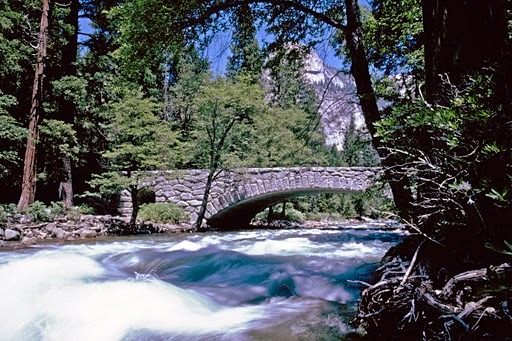 The Merced River at Happy Isles in Yosemite has one of the longest records in the Sierra, dating back to the early 1900s. Shrad Shukla and Andy Wood developed the Standardized Runoff Index (SRI; http://www.hydro.washington.edu/forecast/monitor/info/Shukla_Wood_SRI_GRL08.pdf) to quantify streamflow drought based on the historical distribution. Below is the water year SRI from the Merced River, which is showing the accumulated streamflow throughout each water year. For the SRI, negative values mean drought, and positive values mean wet. 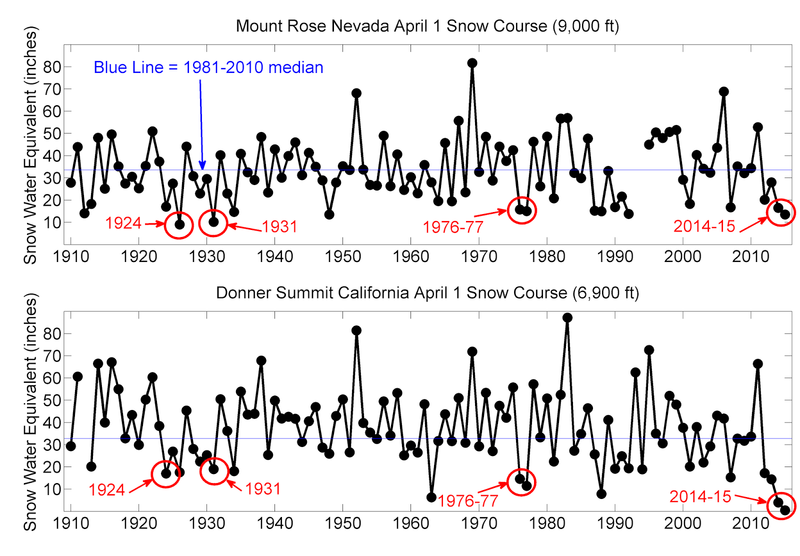 This one only goes through 2014, but tells a similar story as the Mount Rose snow course: 1924 and 1931 were worse single year drought than 2014. Based on this SRI 1977 was actually the worst single year drought. Looking at the abysmal snow pack for this year, the 2015 water year SRI may actually be the new worst. There are many things to consider when looking at the current drought, and depending elevation, orographic positioning, and variable being considered you will find different results. I've only considered single year droughts here, and this multi-year event (four years now) is certainly one of the most severe in the past 100 years. Well, I'm droughted out! Hopefully in the near future when can discuss extremes on the opposite end of the spectrum! The ongoing western U.S. drought (Water Year (WY) 2012-present) presents a fine example of how variable the climate in this region of the world can be when compared with the more bountiful of cold seasons. 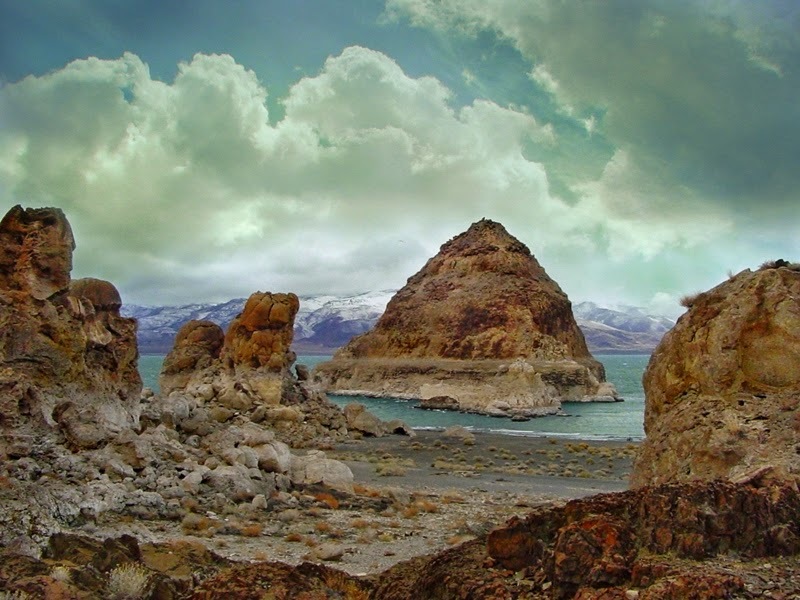 Prolonged dry periods are not abnormal on geologic timescales and may be the rule rather than the exception, contrary to what we would prefer. Of course, present-day temperature anomalies worsen the effects as increases in temperature results in greater atmospheric water demand and less precipitation falling as snow. The result is less runoff, which in a society that dramatically undervalues the true value of water and overvalues activities that favor water waste creates myriad problems. Such problems span the gamut of socioeconomic and ecologic spectra and will require both creativity and sacrifice to solve. Since the end of WY2011, which ATLiens four light years away are now observing ("mmmmmm Eagle's Nest izzzz looking gooooooood"), we have been shown that our "Western Heritage" is in jeopardy. Society has been bumping up against the speed bump guarding an irreversible state change of California (pun intended) and may roll over into the abyss should the drought persist. What's four years when 100-200 years are possible? Should the next couple of years be 'normal' (wouldn't that be nice) or even 'above-normal' (WHAT?! 118%! No way!) the current level of freakout might be climatically-mitigated and we can write about how rad it was to ski Tom and climb 15 stars worth of evening 5.11 at the Gorge in the same day. Pow to corn to pump to Las Palmas, oh yea! Or, the drought will continue in year 10 and maybe then your average Californian could explain to you where their water actually originated. Time will tell. A golden opportunity awaits the Golden and Silver States to rapidly reorganize and shore up the fortifications of climate resiliency that are presently weakly, if at all, existent. Nearly infinite obstacles are in the way of such change, remnants of the Manifest Destiny still woven thickly through our softshells and Prana shorts. How to surmount such challenges I cannot know. I have removed over 2000sq ft of turfgrass on my property, reducing the water usage by 50%, all the while planting copious pollinator-friendly, climatically-adapted plants. Any water I free up in the system will be quickly snapped up by someone else for a use they deem worthwhile. On goes the cycle. I've waxed and waned, but let me return to my thesis statement. Climate in the Pacific Southwest has and always will be highly variable. For many of us, previously extended dry periods are at best faint memories. We have now gotten a taste of what is possible and how to adapt our recreational activities and perceptions accordingly. Most likely, a decent or even great shred year is on the horizon within the next few years, but this is not a guarantee by any means. Life is all about gaining perspective. Seeing how one's perspective shifts in light of new evidence is a fantastic learning experience. To be sure, not all learning experiences are fun while they happen. But when you can reflect back with a higher level of understanding and say, "Well, that really wasn't SO bad..." the experience is usually recorded as a positive one. This process is often qualified as "Type 2 Fun." When you know an activity is going to be Type 2 Fun heading into it (or realize it before it ends), you might gain the psychological momentum to keep pushing forward despite the challenges. I see the drought situation in a similar light. Make the best of it, learn from it, and be stoked to capitalize on new opportunities. Once seasonal Type 1 Fun returns, 2011-XXXX will be just a long string of bike rides, hand cracks, slushy jibs, bolts, and core shots. Well, mother nature sure has a sick sense of humor. We will probably see the coldest or close to the coldest storms all winter over the next 5 days...in April. Makes me think of that classic line, 'Isn't it ironic? Don't you think?' from that even more classic Alanis Morissette song, 'Ironic'. I don't know if our coldest storms coming in April at the tail end of a warm, drier winter qualifies as irony, but hey, Alanis Morissette didn't really understand irony either. Figure 1. Storm total precipitation for the Saturday/Sunday storm(s). ANYWAYS...look for snow possibly tonight, but for sure tomorrow afternoon and evening. We expect 3-6" of snow with some areas seeing near ~8" and snow levels down to 4000-5000' (Figures 1-2). A bigger storm comes through Tuesday into Wednesday. This storm is trying to push more south than east, which could limit the impact around Tahoe. This storm is cold and wet though, so let's hope it swings more to the east. Figure 2. 9,000-10,000 ft. winds, temperature, and heights. Very cold storms will be moving through the Tahoe area. If the second storm takes a more easterly track, the Sierra and around Tahoe could see 8-14" with some of the highest elevations pushing 18". As of right now this isn't happening, so a more conservative estimate would be 4-8" (Figure 3). Figure 3. Showing total precipitation from Saturday morning to Thursday morning. If this was December or January, I would be pumped, but it is April and we have 5% of the normal snowpack. However, with the drought, this is much needed and welcomed and it may extend some backcountry excursions for another week or two.